Data blending is a method for combining data. Data blending works by supplementing the data in the primary data source with the data in the secondary data source. Aliasing is the alternative name that you can assign to a value in a dimension field. You can use aliases to rename specific values within a dimension. This can be useful when you want to show more relevant or descriptive dimension values in your view than what the original data provides. You can use data blending as a method for re-aliasing values in a data source by using field values from another data source. To do this, there must be a field in the secondary data source that contains aliases for a field in the primary data source. For example, suppose you have a primary data source that contains information on fruit, including fruit names and code values that the fruit are associated with. A secondary data source contains a field with more descriptive code values. When you re-alias a field in your primary data source, you can create a view that replaces the original code values with the more descriptive code values. Note: After you have used the secondary data source to provide aliases for the primary data source, you no longer need the secondary data source and can close it. Set up the primary and secondary data sources and establish a relationship between the data sources. For more information, see Step 4: (Optional) Define or edit relationships . The data sources used in this example are Fruit Stand and Alternate ID. Select the primary data source in the Data pane, and then drag the field that you want to alias to the view. For this example, Fruit Stand is the primary data source. Select the secondary data source in the Data pane, and drag the field that contains the alias information to the view. For this example, Alternate ID is the secondary data source. Note: The field you are using to alias the field values in the primary data source cannot be the linking field you are using to link the primary and secondary data sources. 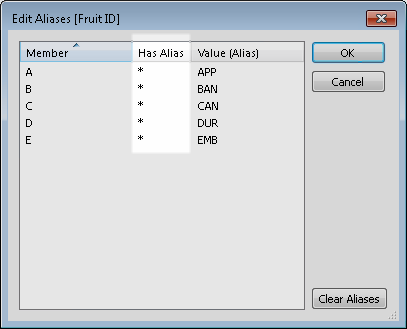 In this example, Alternate ID field in the secondary data source contains the aliasing information needed by the Fruit Stand field in the primary data source. Right-click (control-click on a Mac) the field from the secondary data source and select Edit Primary Aliases. Values in the primary data source must have corresponding alias values in the secondary data source. An asterisk under Has Alias confirms that the data sources have corresponding alias values . Note: If asterisks don't appear under Has Alias, then either the secondary data source doesn't have the corresponding aliases to match the field values in the primary data source, or there is more than one field value in the primary data source that has the same alias in the secondary data source. In cases like this, aliasing field values in the primary data source with data from the secondary data source is not possible. Click OK. The alias values in the secondary data source replace the field values in the primary data source. In this example, the more descriptive code values from Alternate ID field replaces the values in the Fruit ID field. (Optional) Select the secondary data source from the Data menu, and select Close. To watch a video that demonstrates aliasing field values using data blending, see Cleaning Data by Bulk Re-Aliasing.